If you have any interest in either fantasy basketball or the history of basketball (but preferably both), I suggest giving RotoMonster a look. It’s a simple, easy to navigate fantasy basketball archive that covers every NBA season from 1952 to now. There’s a ton worth discussing from there and maybe I’ll dedicate a series of posts to what I find, but for now I wanted to use it to write/brag about one of my favorite players ever, Shawn Marion. 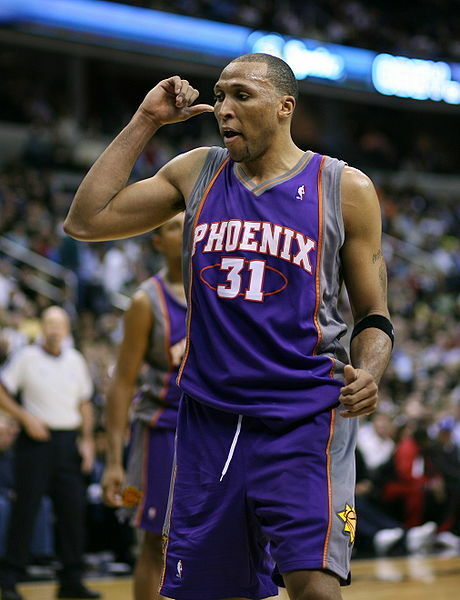 But if there’s one description for both the real-life Shawn Marion and his fantasy basketball version, it’s that they were both freaks of nature during their time with the Suns. He could do it all statistically with his average line from 2001 to 2007 being 19-10-2-2-1 with 48/34/83 splits, one chest-passed three, and 2.8 free throws per game. He wasn’t a turnover machine either, ranked outside the top 50 in that category. That made him more valuable in 9-category leagues than 8’s, the difference in the leagues being the inclusion of turnovers in the 9-cats. For Marion’s entire fantasy basketball page, click here. The absence of Amar’e Stoudemire in 2006 led to Marion’s greatest season statistically. Though it was only good enough to make third team All-NBA, it was his most convincing first place ranking in fantasy basketball and arguably the most convincing season of his career in terms of his real, on-court value. He bested the 9-cats over second-place Nowitzki and Elton Brand by nearly .40 points in overall value, the largest margin since 1990. Marion was the only player that season ranked in the top 20 in points, rebounds, steals, blocks, field goal percentage and minutes. Freak. Of. Nature. Basketball-Reference had him listed at center that season. If fantasy basketball leagues gave him multiple positions, he was that much more valuable. Stoudemire’s return in 2007 put a dent in Marion’s production, but he still placed first and second in 9-cats and 8-cats, respectively. Kobe bested him in the latter, thanks to turnovers not being accounted for. 2007 was a monster season for the Suns both in real and fantasy basketball. The core of Nash, Stoudemire, and Leandro Barbosa, along with Marion, made the top 15 in each kind of fantasy basketball league. Per game wise, Marion was one of the best in 2008, ranking fourth in 9-cat leagues and sixth in 8-cats, but he only played 63 games. It was that season when the fantasy basketball torch was passed to Chris Paul, which was then passed to Kevin Durant in 2010. Marion has continued to be a nice addition to fantasy leagues, often ranked in the top 75 in each league since 2009. Where real basketball is played, Marion’s Hall of Fame status is up for debate, though it might be a losing one. In fantasy basketball, however, there’s no doubt the Matrix was one of the greatest of his time.